On a site near Buck Lake, a small community southwest of the Canadian city of Edmonton, a retired Czechoslovakian couple, Anton and Maria Chobot, worked for decades to unveil the history of one of North America’s first human civilizations. The Chobots left their home during the ongoing Hungarian Revolution and settled half way across the world. From there, says Randy Boswell for Postmedia News, the couple started excavating the land near their cottage along Buck Lake. The Soviet Bloc was keenly interested in the Middle East, so I traveled there a lot, especially to Syria. While there, I became interested in archaeology, taught myself how to excavate correctly, and did some excavations at the ancient site of Ugarit, north of Beirut on the Mediterranean, which was good training for what I would unexpectedly come across here in Canada. What they came across was astounding. According to the 2006 book: “In the Chobots’ basement were a great many boxes, maybe more than a hundred, filled with flint tools and flakes,” relics of one of North America’s first humans—the Clovis people. 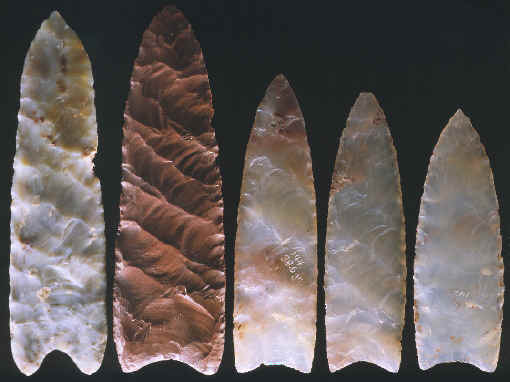 The Chobots had found arrowheads, knives and even simple tools thought to be from humans that had preceded the Clovis. As one of the best preserved sites of Clovis artifacts, the Chobots’ archaeological dig is now at the center of a scientific controversy, says Boswell. Research teams across the world are trying to figure out what killed off the Clovis, and ongoing research at the Chobot site could help them answer that question. Roughly 14,500 years ago the world started to warm, throwing off the shackles of the Ice Age and creeping into the temperate conditions that have supported much of human history. The warming encouraged the entry of some of the first humans into North America roughly 13,000 years ago, including the Clovis people. A few thousand years into this climatic change the warming suddenly stopped. The conditions across much of the Northern Hemisphere shot back to glacial conditions in just a thousand years. In Venezuela, says NOAA, the temperature dropped 5.5 degrees. Across the Northern Hemisphere, dry conditions set in. Scientists aren’t really sure what caused the dramatic cooling, an event known as the Younger Dryas. Most blame the cooling on a change in ocean circulation patterns and the melting of the Arctic, but some favor another trigger—an asteroid. Whatever the cause, the effects of the Younger Dryas were deadly: The Clovis people, along with the mammoths and giant bisons with which they shared the land, were wiped out. In a new study, scientists report that tiny spherules, thought to have been produced when a massive asteroid exploded over the Canadian sky, have been dug up at the Chobot site. The find is reinvigorating the debate over the cause of the Younger Dryas, says Boswell for Postmedia News.